First, let's have a little history because I doubt my fellow Americans have never heard of Sweden's Eclipse. The band was formed in 1999 by singer Erik Martensson. He cut a demo that landed him a deal with Z Records in England. With a full band in tow, Martensson delivered the first Eclipse album 'The Truth & A Little More' in 2001. This and some severe determination landed them a contract with Italy's Frontiers record label. Eclipse produced 'Second To None' in 2003 which was a highly acclaimed album among the melodic rock audience. 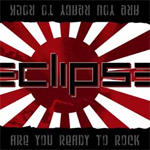 In 2008, Eclipse returns after a lengthy absence, with 'Are You Ready To Rock' which comes to me from Frontiers via the new giant of international music marketing, Blistering Records. On their third full length release 'Are You Ready To Rock,' Eclipse gets right down to business. Straight out of the gate and all the way to the end you get straight up melodic hard rock with tons of enthusiasm, catchy riffs and big choruses. Albeit, not every song is perfect or intensely gripping, but there is definitely no filler here (and not a single ballad I might add). What will truly charm you ears is the breathless passion of Martensson's vocals and the tight rhythm section which moves effortlessly through every song. True gems include 'Breaking My Heart Again,' 'Hometown Calling,' 'Hard Time Loving You,' and '2 Souls.' As I mentioned not all songs are equally as compelling as these. 'Young Guns' (a poor imitation of Whitesnake) and the closer 'Call Of The Wild,' though astutely composed and well performed, are generic, almost cliche, rock numbers. Even with that latter caveat, Eclipse's 'Are You Ready To Rock' is probably their finest and most consistent work to date. If anything Eclipse will persuade you with their exuberant enthusiasm and skilled musicianship. Recommended for all lovers of melodic hard rock. On their third full length release 'Are You Ready To Rock,' Eclipse gets right down to business. Straight out of the gate and all the way to the end you get straight up melodic hard rock with tons of enthusiasm, catchy riffs and big choruses. Eclipse's 'Are You Ready To Rock' is probably their finest and most consistent work to date.